Everyone from financial institutions to employers are using your credit report to decide if they are going to do business with you or hire you. There has never been a time in history when having a good credit report has been more important than now. Unfortunately, many people are unaware of issues on their credit report until after they have been denied employment or credit. Taking a proactive approach to monitoring your credit is critical to creating and maintaining a good credit profile and score. You need to know what is on your credit report, what it says about you and whether it is accurate or not. With 750 Credit Monitoring, you will be alerted to activities that may impact your credit score, which gives you the opportunity to recognize unfamiliar or questionable credit activity before others realize something may be wrong. And if it’s inaccurate or the result of fraud, give you the heads up so you can get it corrected right away. 750 Credit Monitoring can help you stay up to date with what’s going on with your credit picture and enjoy more control over your personal information. We continuously monitor the member’s Experian credit data and report for any adjustments or changes to your profile 24/7/365 through real-time alerts. Our credit score tracker provides members with a clear and concise view of their credit score history over the lifetime of their membership. 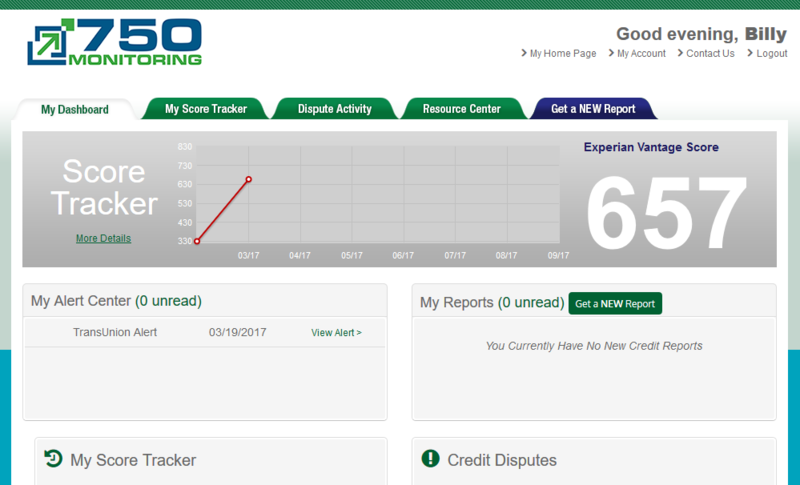 The 750 Credit Monitoring Score Tracker can be used to track your credit progress while working to improve your credit score. Experts recommend checking your credit report at least once per year. Members receive a 1-bureau credit report with 1 score from Experian upon enrollment. Members can purchase additional credit reports anytime for only $4.00 for a 1-bureau report or $8.00 for a 3-bureau report. Members have unlimited access to their credit report and scores via the membership website. Start taking control of your credit profile Today!